Use of the foam roller for self treatment is called self myofascial release (SMR). It is a form of self-massage used to increase flexibility, joint range of motion and decrease unwanted muscular tension and the effects of trigger points. Myofascial release has been described as, “A type of soft tissue therapy used in osteopathy to release physically restricted musculoskeletal groups. It is believed that chronic tension and trauma cause the fascia, which envelop muscle, to become fixed in a particular position, known as a myofascial restriction. Manipulation of the myofascial group is believed to resolve the restriction”. (Segen’s medical dictionary, 2011). Fascia is “A sheet or band of fibrous connective tissue enveloping, separating, or binding together muscles, organs, and other soft structures of the body.” (American Heritage Dictionary of the English Language, 2011). SMR is widely used in the fields of physiotherapy and fitness to improve joint range and flexibility and help with post training soreness/delayed onset muscle soreness (DOMS). The action of using the foam roller has an effect upon many tissues in the body including muscles, fascia, nerves, and epithelial tissues (such as skin and blood vessels). It can be used to break up adhesions (knots) of the fascia and the muscle tissue it surround thus improving tissue extensibility, joint range of motion, and even reduce pain and soreness. The thoracic spine (Tx) consists of the 12 thoracic vertebrae and the associated pairs of ribs aligned in rings. Despite one of its prime functions to protect our vital organs, the thoracic cage should be quite mobile and flexible. When the thorax become stiff and less mobile, or dysfunctional, we see problems arise in others areas such as the low back and neck as these areas become more mobile. Keeping the thorax mobile is essential for spinal, shoulder and even organ health. The thorax has 12 vertebrae and has the ribs attached to these segments forming rings that protect the organs underneath and provide some rigidity to the skeleton. Despite the fact that the rib cage is more rigid it still has the ability to move in all 3 directions (forward/backwards, side/side, twist left/right). Good thoracic mobility is essential for lower back and neck health. If the Tx becomes stiff, more movement will be driven in the spine above and below and often lead to pain and dysfunction in these areas. The ribcage also has the only attachment for the arms at the sternoclavicular joint at the front, and a muscular contact at the rear with the scapulas (shoulder blades). Good shoulder movement therefore replies upon a mobile thoracic region and combined movement between the two. The mobilisers below are just a couple of the releases that you can do for the Tx with instant results. As the effect may be short-lived initially it is important to repeat these exercises regularly until the body/brain recognises the new position, tissue length and degree of tension and this becomes your ‘new setting’. 1) Place the foam roller in the mid back, or level with the scapula. Fully support the head and then bend from side to side. Reposition the roller higher or lower after a few reps and work your way up and down the thorax. 2) Start in the same position as above. While fully supporting the head lengthen backwards over the roller as you inhale and then return to neutral with your exhale. We are trying to lengthen and elonate over the roller not bend and fold back over the roller. Apply a small degree of traction to the neck as you fully support the head with both hands. Again, you can move up and down the thoracic region. 3) In the same starting position as above we are now combining extension and rotation. As you lengthen back over the roller, look back towards the right shoulder. Repeat on the other side. 4) This exercise is an osseo-fascial technique for the side of the thorax and also gives great results further down the body into the hips. Place the roller under the ribs and gently roll forward and back along the lines of the ribs. You are looking for ‘gluey’ areas. Be gentle and don’t rush this release. 5) This exercise works into rotation also but drives from the legs up. 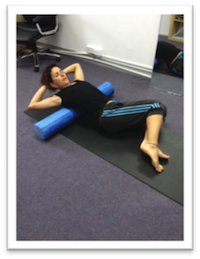 Whilst maintaining a mild extension over the roller, allow the knees to roll from side to side. Have a sense of lengthening from the top knee all the way to the opposite shoulder.